Theory suggests that vitamin MePA might be effective against cancer. MePA is the anti-aging vitamin. Cancer is mainly a disease of old age. Theory suggests that in the process of rolling back aging, the aging-related disease of cancer might also be rolled back. Here is the first pilot study addressed to this theoretical possibility. The last chapter in Aging: Cause and Cure, by Dr. Gerald E. Aardsma, covers a personal testimonial of his experience with taking methylphosphonic acid (MePA) as well as that of his wife. They are the first two people known to have begun testing this experimental vitamin in modern times. I am the third. This is my own testimonial, submitted at his invitation. He invited me to participate in a trial when he found out that I have a medical condition that might be improved by taking MePA. Let me begin with some background. I hope it is not too boring. In November 2013, a PSA (Prostate Specific Antigen) test result (9.3) and a digital rectal exam suggested that I might have prostate cancer. Later tests and consultations with specialists at the Duke Cancer Center in Durham, NC, confirmed this diagnosis. In particular, three of four targeted needle core biopsies on the left side of my prostate gland yielded a report of prostatic adenocarcinoma (prostate cancer), one with a Gleason score of 8, two with 6. No cancer was detected in any of the four other core biopsies, including all three taken on the right side. The "high grade" cancer found in my prostate gland was considered too pervasive and too aggressive to advise watchful waiting or any option for targeted treatment of only specific parts of the gland. Therefore, on April 17, 2014, a robotic radical prostatectomy was performed on me at Duke as recommended. In less technical terms, my entire prostate gland was removed at this time, along with seminal vesicles and some nearby groups of lymph nodes. A nerve-sparing technique was used on the right side but not on the left side. The procedure was somewhat complicated, partly because my prostate was stuck to the front of a rectal wall. After the surgery, the removed items were examined to see whether any cancerous tissue was cut. Any cancer found at a cut would have meant that some cancer had been left behind in my body. No problem was found, and the Gleason score was revised down to 7. This was all good news, suggesting that I might be rid of prostate cancer. On July 31 [data point 1 on the graph] and again on October 15, 2014 [point 2], I went back to Duke to have my PSA level checked. Both of these times, it was reported to be less than 0.01, which was considered undetectable PSA. This was good news too, because if PSA had been detected so long after the surgery, it would probably mean that some cancer cells had escaped the prostate and continued to produce PSA somewhere else in my body. Unfortunately, this was not the end of the story. The next test on March 27, 2015 [point 3], showed that the level was up to 0.04, but this was still too low to cause concern. Similarly, even though the result of yet another test on March 7, 2016 [point 4], was 0.25, not even this level seemed particularly alarming to me. However, when the result of a test on April 7, 2017 [point 5] was 1.6, I became concerned. In 2016 and again in 2017, the PSA level was about six times what it had been the year before. My doctor at Duke agreed that I should be concerned and recommended that I have the PSA test repeated at Duke. I had this done there on May 23 [point 6], and the result was 1.93, even higher than it had been the month before. (Results from different labs are not necessarily comparable.) At this visit to Duke, I also consulted with a radiation oncologist, who suggested that I was probably going to want to do something about this "biochemical recurrence" of prostate cancer. Cancerous cells had evidently escaped from my prostate before surgery after all. None of the suggested treatment options seemed pleasant to me. PSA doubling time (how long it takes one's PSA level to double) is considered a measure of how aggressive the cancer is. If it is very slow, say a year or more, the problem might be ignored by someone my age (70 in June). I wanted to see a medical oncologist for a second opinion. Perhaps like many men, I considered hormone therapy and any form of castration, chemical or otherwise, to be obnoxious, an absolute last resort. I returned to Duke on June 16 for the desired second opinion of a highly qualified medical oncologist. We agreed to wait on beginning treatment, since my PSA was still rather low. He wanted me to come back for a bone scan and another PSA test in about three months to get a better handle on how aggressive my cancer is. He calculated my PSA doubling time then to be 4.9 months, which he considered indicative of fairly aggressive growth of the cancer. Not long after the visit to Duke in June, I let Dr. Aardsma know about my condition, and he immediately suggested trying MePA to see whether it might help improve my condition. At first, I tried to buy MePA on the open market but discovered that it is sold to research organizations and educational institutions only. It could not be shipped to a private residence. Fortunately, Dr. Aardsma graciously supplied me with a dropper bottle of his vitamin MePA dietary supplement, and I started using it on July 17. For the first six days, my dose rate was 2 micrograms per day. Ever since then, with his assent, it has been 4 micrograms per day. After I started taking MePA and while waiting for my September appointment at Duke, I was already in good health and did not notice any remarkable change in my health, with only one or two possible exceptions. When I went to see the solar eclipse in August, I got sunburned, and I was surprised that it did not hurt at all. I also suspect some improvement in healing time. I accidentally jabbed a sharp stick into the palm of my hand. Today, less than four weeks later, the wound is barely detectable as a faint scar. The "acid test" of MePA came on September 27, when I returned to Duke for the bone scan and my most recent PSA test. (My bone scan raised no concerns, but this result was expected.) If my PSA doubling time had remained steady, then my PSA level would have been at about 2.5 when I started taking MePA, and it should have risen to about 3.5 by the date of this test. Those projected levels could have been even higher, depending on the data points selected for inclusion in the calculation of doubling time. I was amazed by the new result, which was only 2.31, well below the expected level, even with a conservative doubling time. Dr. Aardsma provided the chart above to illustrate. The black line plots my rising PSA level (either measured or extrapolated), the vertical red line marks the date of my first dose of MePA, and the pink dot at the right edge [point 7] marks my unexpected PSA test result (2.31). Each date at the bottom is 200 days before or after an adjacent date. Of course, PSA levels are indicated at the left edge. My oncologist was evidently less amazed than I was. He explained that the doubling time can vary when the PSA level is still this low, but we agreed that there was no need for me to begin treatments right away. He wanted me to come back for another PSA test and consultation in about three months. Regardless of my doctor's expert opinion, I am delighted and thankful, not only to Dr. Aardsma but also to God and to those who prayed for me. After all, it was ultimately God who left us reliable life span data in Genesis and gifted Dr. Aardsma with the faith, patience, intelligence, determination, and whatever else may have been needed to take enough advantage of the information provided to discover vitamin MePA. Nevertheless, not even this matches God's wonderful grace and the gift of eternal salvation to me and anyone else who will receive it (John 3:16; Rev. 22:16-17). The latest PSA result suggests that my system has been significantly rejuvenated, allowing it to fight off cancer cells, wherever they may be in my body, especially in light of the fact that the level of MePA in my system, though slowly rising, may still be well below the optimum level. Of course, the results of my next PSA test, currently scheduled for early January, should be even more enlightening with regard to my future prospects for full recovery from prostate cancer. In the meantime, I am continuing to take MePA without any other form of cancer therapy. If MePA can cure Dr. Aardsma's case of CIDP (Chronic Inflammatory Demyelinating Polyneuropathy) and my biochemical recurrence of prostate cancer, then it offers everyone with a similar medical condition considerable hope of dramatic improvements in health at low cost and in a short amount of time. Obviously, it would take hundreds of years to prove that MePA can allow someone to live to be hundreds of years old. Anyone waiting for this proof may wait too long and never receive any benefit, but MePA should still be attractive if it really does provide significant improvement in quality of life now. Please see Helen Aardsma's personal testimonial in Aging: Cause and Cure for a case where a significant health benefit has been noticed even though no serious medical condition was involved. Anecdotal evidence like mine should be considered less reliable than formal clinical studies, of course, but at this stage, even this kind of evidence should be of interest. Not counting the fascinating theory behind Dr. Aardsma's discovery, this is still the best evidence of MePA effectiveness that can be offered at this time. As usual, your results may vary. Tom's PSA continues to be monitored on a regular basis by his health care professionals. The table and graph below show the latest results. Error bars (1σ) have been added to the graph to help visualize the scatter in the data points. 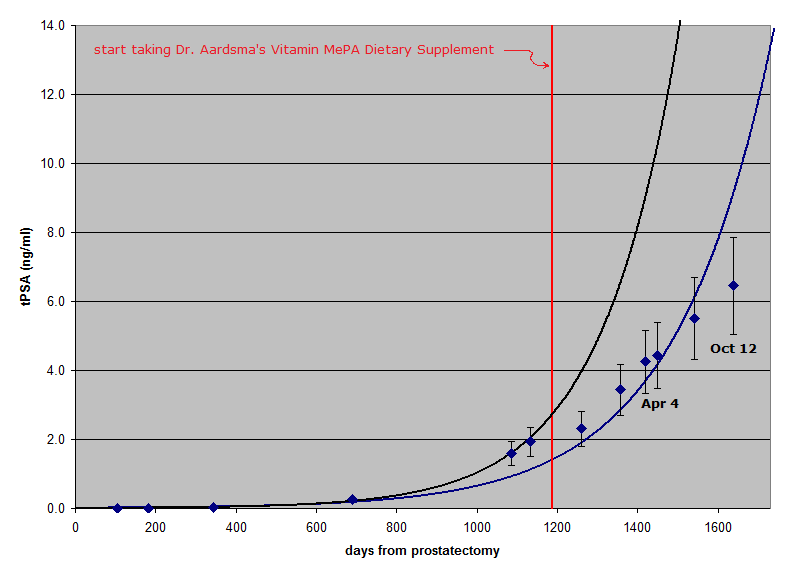 The black line is the best-fit exponential growth curve for the data points up until Tom started taking Dr. Aardsma's Vitamin MePA Dietary Supplement. The blue line is the best-fit exponential growth curve for the entire dataset. It is clear that progression of Tom's cancer has been slower since he started taking vitamin MePA than it was predicted to be before he started taking the vitamin. It is still far from certain, however, that this outcome is due to the vitamin. The uncertainties in the measured data points, shown by the error bars, are relatively large. These uncertainties arise because of biological fluctuations in PSA from day to day. These large uncertainties make it possible that Tom's pre-MePA measurements just happened to come out high by chance. As Tom stated above, improved reliability can be obtained from a clinical trial involving many test individuals. The present pilot study on Tom encourages the undertaking of such a clinical trial. Meanwhile, notice that what we are not seeing here is a rapid cure of prostate cancer by vitamin MePA. This emphasizes that the best strategy is to take the vitamin faithfully every day while one is still youthful, to prevent aging related diseases from ever getting started. The story of my fight to survive prostate cancer continues. If you have not done so already, please read my testimonial and the July 10, 2018 update above. Nothing in them needs to be corrected or walked back. On October 12, I returned to Duke for a new PSA test, a CT scan, and a full body bone scan. Both scans revealed areas of concern. A small area, maybe about the size of a pea or a marble, where my prostate gland used to be, appeared in the CT scan and is assumed to be cancerous. A radiation oncologist and my medical oncologist (cancer doctor) at Duke recommended targeting it for treatment. An even smaller spot appeared in the bone scan near the upper end of my left femur (upper leg bone). In a case like mine, cancer cells often lodge in bones. I returned to Duke on October 22 for a follow-up PET scan. Based on the results of this scan, the femur spot was dismissed as a degenerative issue, and cancer there was ruled out. Fortunately, no other sign of cancer in any of my bones was found in this PET scan using radioactive sodium fluoride as the tracer. On October 31, I went back to Duke and began receiving treatment of the suspected cancer in abdominal soft tissue with Lupron Depot® therapy. (Lupron Depot is a registered trademark of AbbVie, Inc.) The dose in the one shot I received on that date is designed to reduce my testosterone levels during a six-month period, thereby weakening prostate cancer cells and making them easier to kill during later radiation therapy, now planned for January and February of 2019 at a separate facility closer to home. In addition, I am taking one 50-mg tablet of bicalutamide daily for thirty days, beginning the same day I received the Lupron shot. Both medications are for hormone therapy. Between July 2017 and October 2018, with the knowledge and uncomplicated assent of my doctor, I received no treatment for my cancer, not counting Dr. Aardsma's Vitamin MePA Dietary Supplement. I have continued taking MePA without interruption, but on January 7, 2018, I increased my dose rate from 4 micrograms (2 drops) to 8 micrograms (4 drops) per day, and I plan to continue taking it at this rate while receiving the treatments described above. I am hoping that MePA will reduce side effects that I might otherwise experience. I have not yet noticed any symptom due to cancer since my prostatectomy. The first sign of a recurrence of my prostate cancer was an alarming rise in the PSA level in my blood. Until I started taking MePA, my PSA doubling time was used as a measure of how aggressive the cancer is. Since then, my doctor at Duke seems to have lost interest in the doubling time, even though he has continued to monitor my PSA level by testing it about every three months. The latest result was 6.45 on October 12, which is 1,639 days after my prostatectomy. 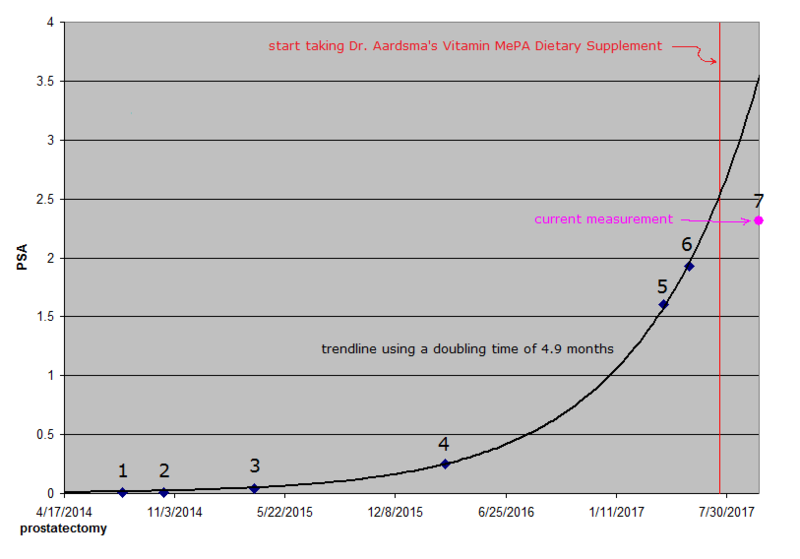 See the graph below that Dr. Aardsma prepared for this update. The six data points that now lie to the right of the vertical red line, which shows when I started taking MePA, are close to a straight line. The black line shows the best fit exponential growth curve for the data points prior to the red line. 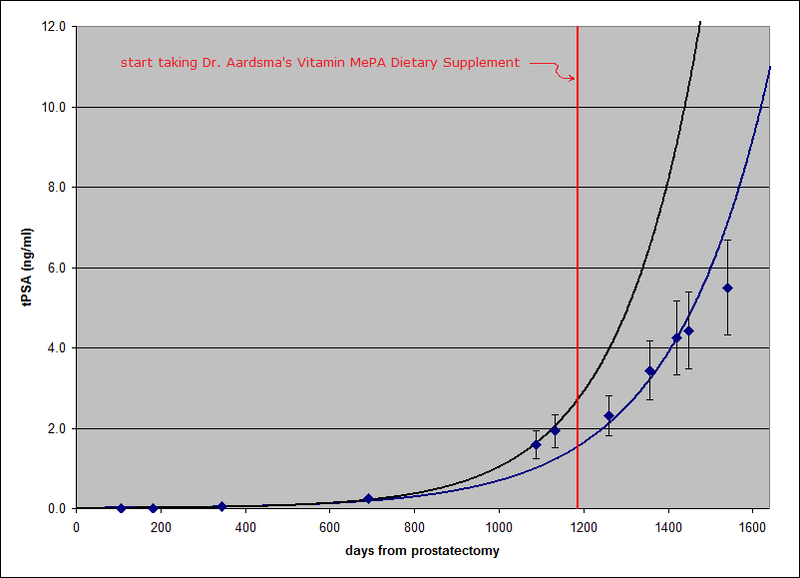 My PSA level since starting on the vitamin has very clearly not followed this black growth curve. The blue line is the best-fit exponential growth curve for the entire dataset, including the new data point. The vitamin seems to have slowed growth of the cancer. Curiously, however, the trend of the six PSA data points after I started taking MePA seems more linear than exponential. PSA seems to be rising by 1.0 about every 90 days, regardless of what the previous result was, and this linear trend has continued for a full year. An exponential trend with a doubling time makes sense to me. If it takes an average of 4.9 months or 149 days for cancer cells to reproduce and survive (black line), I would expect the size of the cell population to double in this amount of time, and if the PSA production by each cell remains practically constant, the PSA level should rise accordingly. Consequently, if the doubling time were still 149 days when my PSA level was 4.43 on April 4 this year, it would have doubled to 8.86 by August 31 (1,597 days after my prostatectomy), but in fact, it was still only 6.45 six weeks later, on October 12. Because of several, complicated factors that can affect PSA levels, my doctor is not impressed by this change in the trend, but he admitted that he cannot explain the fact that we now have six data points so close to a straight line that spans a whole year. Naturally, we hope that the treatment now in progress will kill most, if not all, of the cancer cells that have been causing my PSA level to rise. My doctor plans to continue PSA tests during treatment, since changes in PSA level will serve as a relatively inexpensive measure of effectiveness. In the meantime, I thank Dr. Aardsma and everyone who has prayed for me for their concern, persistence, dedication, and generosity. Above all, I thank and praise God for making it possible for me to participate in this pilot study of MePA effectiveness in a case involving prostate cancer. May my experience somehow be used to improve the length and quality of life for many others. Tom has now begun treatments for his recurrence of prostate cancer, making this update the final look at the effect of vitamin MePA alone on prostate cancer in Tom's case. Going into this pilot study, there were only three theoretically possible outcomes: 1. MePA has a negative effect on prostate cancer, causing it to grow more quickly, 2. MePA has no effect on prostate cancer, or 3. MePA has a positive effect on prostate cancer, causing it to slow down or disappear entirely. The data we now have, thanks to Tom's courage and generosity in sharing this part of his life with us, is most supportive of the third possible outcome, that MePA has slowed progression of the cancer. Because of the intrinsic biological uncertainty in PSA measurements, the second possible outcome, that MePA has made no difference, cannot be entirely ruled out, but its probability is low---less than 3% based on the best fit exponential growth curve to the entire dataset shown by the blue line. Meanwhile, the first option, that MePA causes prostate cancer to grow more rapidly, may be definitively ruled out. An intriguing, possible explanation of the apparent linearity of Tom's six post-MePA data points is that MePA may be slowly strengthening Tom's immune system, enabling it to identify and destroy cancer cells better as time goes on. Supporting this possibility is the fact that each of the six measurements since Tom started taking MePA has come in below what was predicted based on the total set of data points preceding it. The black line in the new graph above shows this starkly for the first of these six data points. The black line is based on the data points to the left of the red vertical line. Notice how the first data point to the right of the red line is far below the PSA value predicted by the black line for that date. The blue line in the July 10, 2018 update graph shows it starkly for the latest data point. The right edge of the gray area in this graph corresponds to October 12. Notice that the blue line predicted a PSA near 11 for this date, but the October 12 measurement (not shown on this graph) has now come in well below this, at just 6.45. I am personally thankful to Tom for his willing cooperation in this pilot study. His data now provide empirical motivation for pursuit of a more definitive clinical trial. He has been a true pathfinder. I am sure Tom would appreciate all our prayers as he begins his next phase of treatments for prostate cancer.